Among one of the tallest tree varieties in the world, the Douglas Fir, grown in its preferred conditions, can reach a height of 300 feet. The Douglas Fir is not related to Abies, the true fir. There are five species, one from Mexico, two in eastern Asia, and two native to western North America. Botanists renamed the Douglas Fir on several occasions, until it was finally given the name pseudotsuga, meaning false hemlock, in 1867 by the French botanist Carrière. The common name honors the Scottish botanist who first introduced the tree into cultivation in 1826, David Douglas. The species name, menziesii, honors Archibald Menzies, the Scottish physician and naturalist who discovered the tree on Vancouver Island in 1791. These trees can live for up to a thousand years. They have some fire resistance because of their very thick bark, which contributes to their longevity. 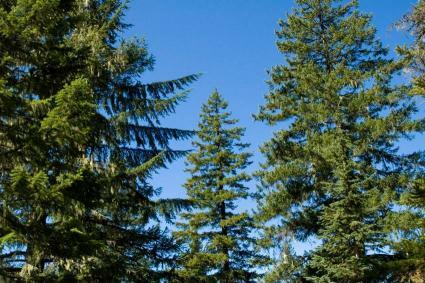 The Douglas Fir is Oregon's official state tree. They are also one of the most popular Christmas trees in North America. Pseudotsuga menziesii var. menziesii is the second-tallest tree in the world, just after the Coast Redwood. In old growth forests, trees of 250 feet in height and 6 feet in diameter are common. The "Brummit Fir", found at East Fork Brummit Creek in Oregon, is the tallest specimen on record at 329 feet. On mature trees, the bark is up to 12 inches thick and has a corky texture. This conifer has a conical growth habit with shallow roots. Pseudotsuga menziesii var. glauca grows up to 200 feet in height in its native habitat of the Rocky Mountains, but usually matures to about 50 feet in other environments. It has a pyramid shape and the branches often droop slightly.. The needles are dark green and have a sweet scent; the dark brown bark is very thick with a ridged surface. The Douglas Fir is hardy in zones 4 to 6. It can be grown in zone 7 with extra care during hot and dry periods. Pseudotsuga menziesii thrives in full sun and is intolerant of shade. It likes a moist but well-drained soil with a pH between 3.7 and 6.5. Douglas Fir is not tolerant of dry soil. It has a moderate to fast growth rate. It tolerates pruning and shearing, and should be protected from exposure to strong winds for the best appearance. Douglas Fir has been the favored Christmas tree in the Pacific Northwest since the 1920s. Pseudotsuga menziesii var. glauca is now extensively planted on Christmas tree plantations throughout the Midwestern states. For landscaping purposes, Douglas Fir is commonly used as a screen or a mass planting. Occasionally it is used as a specimen plant. Pseudotsuga menziesii is often used by timber companies to replant a clear-cut area. It is one of the best timber producers in the world. Douglas Fir is one of the strongest softwoods. The straight-grained wood is used for timbers, pilings, plywood, railroad ties, mine timbers, and house logs. It is also used for structural applications that require withstanding high loads, such as homebuilt aircraft. Coast Douglas Fir sapwood is cream colored and the heartwood is orange-red. It is often used for high grade veneer, interior trim, flooring, and cabinet work. Douglas fir is subject to injury from high winds. It may be attacked by aphids, scale, and bark beetles. Root rot can be a problem on heavy, wet soils with poor drainage. Fungi can cause branch dieback and needle drop.